rec. 2015, Studio 520, Australian Broadcasting Corporation, Adelaide, Australia DDD. 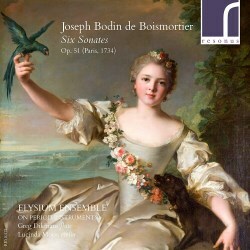 Joseph Bodin de Boismortier was one of the most prolific and versatile composers in France in the first half of the 18th century. By composing music which was pleasant on the ear and not too difficult to perform he was able to earn a good living and remain independent all his life. In a time when nearly every composer was at the service of a court, a city or a church, he was an exception. It brought him much criticism, as his music was considered too easy and rather superficial. Boismortier didn't care: “I make money”, was his simple reply. He published 101 collections with an opus number. In addition his oeuvre contains some collections without an opus number as well as motets and operas. Boismortier also wrote two treatises about the transverse flute and the descant viol (both lost). This shows that he was an exponent of the Enlightenment, which aimed at increasing the knowledge of, in particular, the bourgeoisie; providing them with music which they could play properly was part of that. In that respect one could compare Boismortier with someone like Georg Philipp Telemann. However, there is also something specifically French in his oeuvre. That especially concerns its galant character. Although music in a galant idiom was written across Europe, it was especially popular in France. The philosopher Voltair stated that “[being] galant, in general, means seeking to please”. It is based upon aesthetic ideals which Greg Dikmans, in his extensive liner-notes, describes as “clarity, agreeableness and naturalness”. He quotes from a book about the galant style: “Galant music ... was music commissioned by galant men and women to entertain themselves as listeners, to educate and amuse themselves as amateur performers, and to bring glory to themselves as patrons of the wittiest, most charming, most sophisticated and fashionable music that money could buy". The music by Boismortier was not commissioned: he published music which was within the reach of amateurs. However, one should not underestimate the skills of amateurs of those days. For members of the higher echelons of society music was part of their education. The music which the Elysium Ensemble has recorded fits in with this picture. The Six Sonates pour une flûte traversiere et un violon par accords, sans basse, which Boismortier published in 1734 as his Op. 51, are scored for two contrasting instruments, the transverse flute and the violin, and omit a basso continuo part. That makes them pre-eminently suited for performance in intimate surroundings. They are specimens of what was the fashion of the day: a refined and galant conversation. The transverse flute was by far the most popular instrument among amateurs. This explains why many collections with music for one or several flutes came from the press. Boismortier was one of those who served flute players with sonatas and suites for their instrument. However, in the interest of sales he often offered an alternative for the flute, such as the violin, the oboe or ‘popular’ instruments, such as the musette and the hurdy-gurdy. In the case of his Op. 51, however, he specified the instruments without suggesting an alternative. The second instrument is a violin and this part cannot be played on any other instrument because of the use of double stopping, as the words “par accords” in the title suggest. That is remarkable, considering that these sonatas were intended for amateurs. In such music, double stopping was usually avoided. The chords played by the violin are a kind of substitute for the lack of a basso continuo. As Dikmans puts it: “The violin plays a dual role: joining in a dialogue with the flute while also providing an harmonic accompaniment". The sonatas also show the increasing influence of the Italian style. All of them are in four movements and a mixture of the sonata da chiesa and the sonata da camera as they were standardized by Corelli. The individual movements all have Italian character descriptions - allegro, vivace, andante, presto, aria - or refer to dances, such as sicigliana (sic), gavotta, sarabanda and minoetto (sic). In the course of the first half of the 18th century the form of the rondeau - a refrain with a number of couplets - became increasingly popular, and Boismortier uses it in several movements in his Op. 51. Other movements are either through-composed or have a binary structure. The violin sometimes imitates the flute, and there are also passages in parallel motion. However, most of the time the violin follows its own route, as indicated above. Harmonic experiments are avoided, although the adagio from the Sonata No. 3 in D includes some daring harmonic progressions. This movement has the traits of a recitative. The two artists have made much study of the performance practice of the time, in regard to tempo and rhythm as well as articulation and ornamentation. That has resulted in a compelling recital of pieces which, despite the identical scoring and structure, keep the listener’s attention. Obviously this music was not intended to be played and listened to at a stretch. I had no problems in doing so, but listening to a couple of sonatas at a time and returning to this disc later is probably more rewarding. These are performances in truly conversational style. Greg Dikmans and Lucinda Moon convincingly demonstrate that we do Boismortier wrong when we consider his music as superficial.